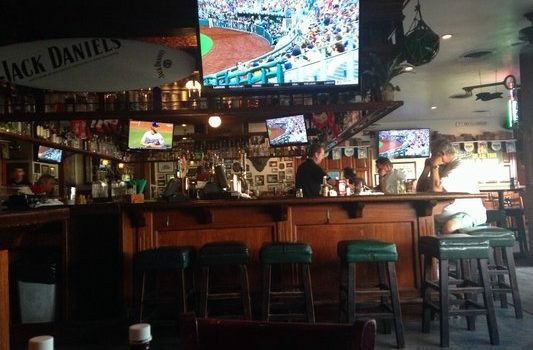 Who is your favorite bar owners in Newport Beach? 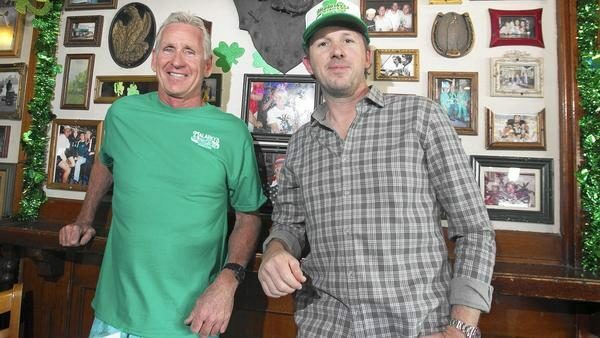 Malarky’s wins top 5 favorite bar owners in Newport Beach. Cstomers will be lining up first thing at 6:30 in the morning, continuing to queue in the midafternoon and standing by at night to get their moment at Malarky’s Irish Pub on Friday — St. Patrick’s Day. They’ll eat free corned beef and hash sandwiches amid a sea of revelers adorned in green. Bill Hamilton, the founder of the Newport Beach bar and restaurant who is now in his 90s, will revisit his old stomping grounds. Bagpipers will play Irish tunes. 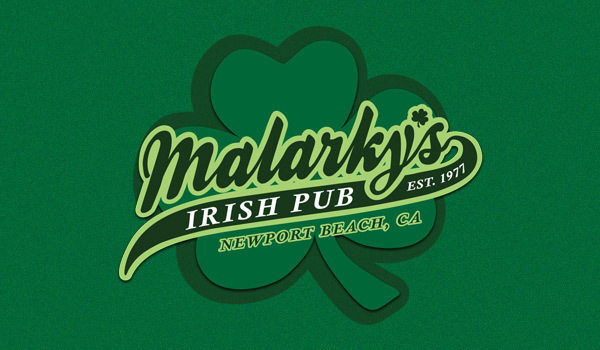 Malarky’s Irish Pub has been a staple of the Newport Beach Peninsula since 1977 and have made corned beef a specialty with four different ways to have corned beef: for breakfast, as a hash, with cabbage, and in a taco. For dinner, corned beef and cabbage is their go-to Irish meal. 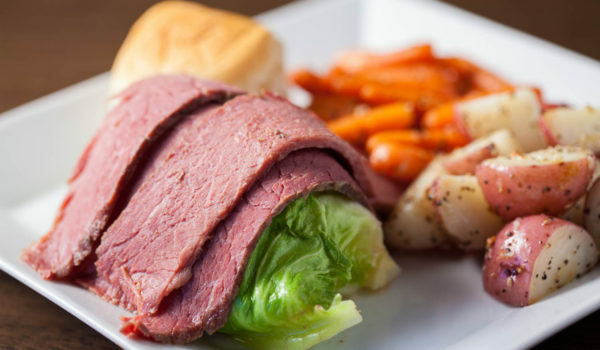 A huge portion of corned beef is served with baby red potatoes, carrots, and specially seasoned cabbage. The corned beef is sliced thin and long in deli-style slices laid across a heaping portion of cabbage. The dish comes with a dinner roll and dinner salad. 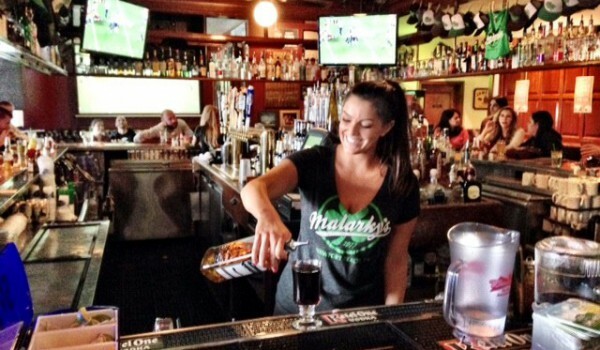 Malarky’s Irish Pub, also on the Peninsula and dating back to 1977, is a local spot with a friendly vibe. Good luck finding a spot at the bar on Sunday mornings, as they are famous for their breakfast meals and sandwiches. They have 46 different whiskeys–from Single Malt Scotch to Irish Whiskey and American Bourbon & Rye. Numerous beers are on tap, and, of course, Guinness and Smithwick’s Irish Ale are found here. They also have Harp Lager in the bottle (one of my favorites). A popular drink here during the St. Pat festivities is their Scotch Mule. 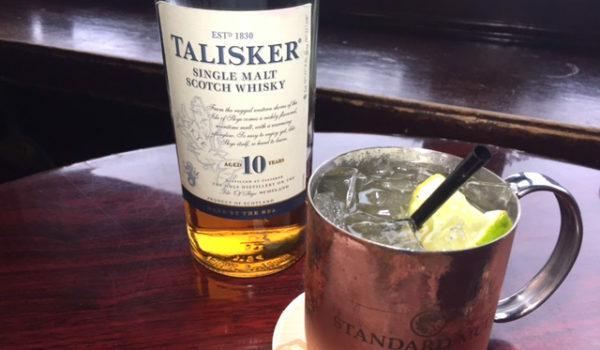 It is made with a shot of 10-year aged Talisker Whiskey (the distillery was founded in 1830 on the Isle of Skye), a squeeze of lemon and lime and a splash of Ginger Beer. It is served in a copper mug, of course! 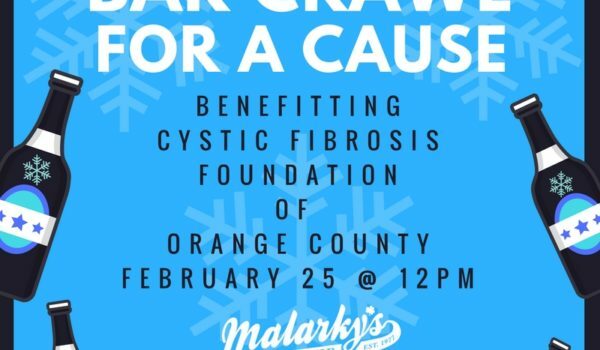 A charity event dubbed Winter Bar Crawl for a Cause on Feb. 25 in Newport Beach will benefit the Cystic Fibrosis Foundation of Orange County. 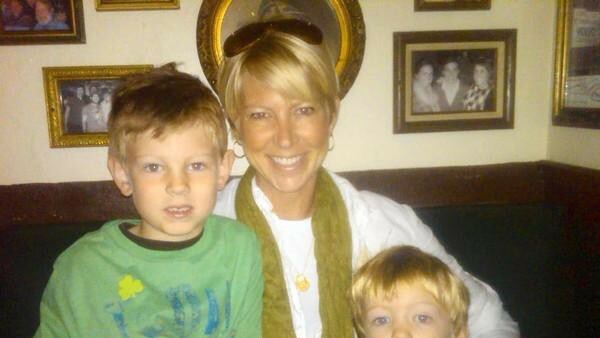 The five-hour event will begin at noon at Malarky’s Irish Pub, 3011 Newport Blvd. Other participating bars are Stag Bar + Kitchen, The Blue Beet and Baja Sharkeez. The event will include drink specials and a raffle for prizes. Tickets are available for $20 the day of the event or at barcrawlforacause.eventbrite.com. Additional raffle tickets are $10. Like most Irish pubs, Malarky’s has a good selection of beer and whiskey for customers. However, those aren’t the only reasons to visit this place. The pub opens at 7:30 for breakfast, when you’ll find dishes like chilaquiles and corned-beef hash with eggs. For lunch and dinner, you’ll find a variety of burgers as well as favorites like fish and chips. If one of the qualities you look for in a rainy-day bar is windows so you can look out on the rain (and enjoy the fact that you’re not in it), Malarky’s is a good place to visit. Windows in front of the bar look out onto Newport Boulevard so you can see those poor unfortunate souls driving in the rain while you remain dry. While you remain dry, you can enjoy a good selection of beers and Irish whiskeys. Plus you’ll find a very good beef stew here that is sure to warm you up on those cool, rainy days. The Irish coffee at Malarky’s is proof that simplicity doesn’t have to be ordinary. Made with coffee and Jameson, then topped with whipped cream, the drink is made on site and is the definition of simplicity. 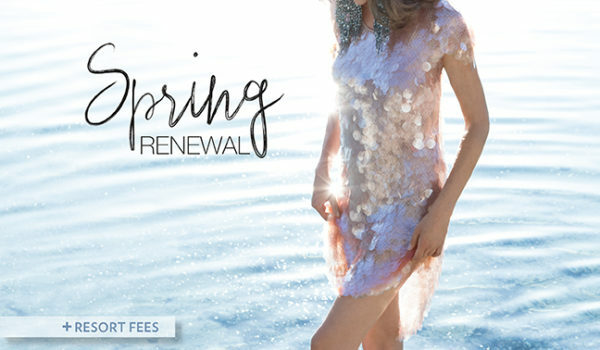 It’s good enough to keep you coming back too. 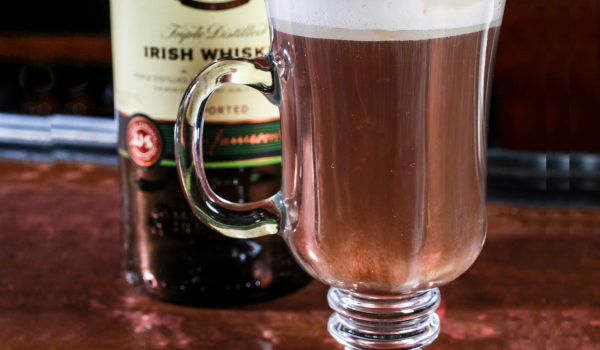 Besides, if Irish coffee is good, then Irish coffee in a pub in Newport Beach is even better. The charity will receive 100 percent of the sales from wristbands and opportunity drawing tickets. The bars also donate 20 percent from food and beverage sales and many participants make donations to the nonprofit. 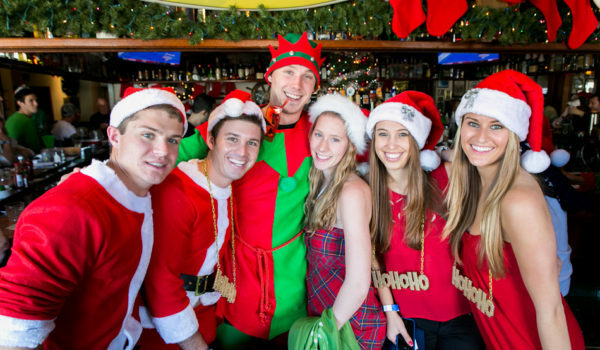 The crawl starts at 1 p.m. at Malarky’s Irish Pub, then makes stops at Newport Beach Brewing Co., Avila’s El Ranchito and American Junkie before finishing at 6 p.m. The jolly group will spend about an hour at each stop. Along the route there will be opportunity drawings, drinking games, a costume contest and other festivities. Prizes from the drawings include sports tickets, vacations, massages and more. Katie the bartender is pouring quite a few Irish Coffees! If I’d had more time, a delicious Irish Coffee or three would have had me seeing triple the crowd. Malarky’s did have the biggest TV of any bar, a 110 inch jumbo screen. The motto at Malarky’s is a quote from Yeats: “There are no strangers here, only friends you haven’t met yet.” It doesn’t take long to figure out that the motto is observed by the patrons here. 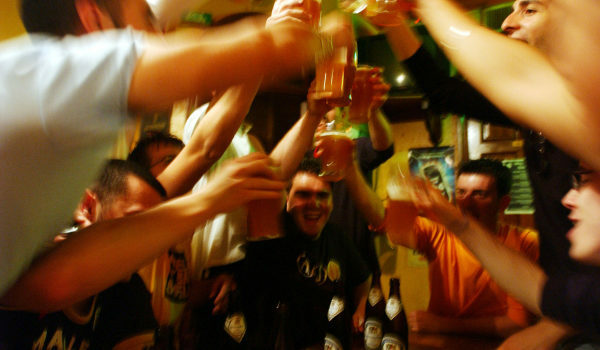 The atmosphere is very much like “Cheers” – a place where everyone knows your name or learns it pretty quickly. If you can’t wait to start your Super Bowl revelry, this is the place for you because it opens at 7:30 a.m. Also, once the game is over, you can take a stroll around Newport, which is never a bad thing to do. 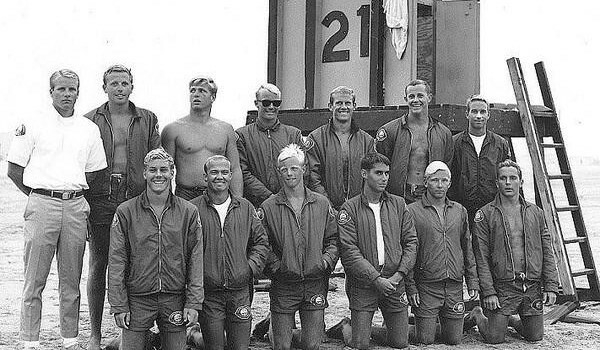 Guards from every decade since the 1950s were on hand at an old lifeguard hangout — Malarky’s Irish Pub, where I work for part-owner and retired lifeguard Capt. Brent Ranek. In old Newport Beach, a pub and dining room on the Balboa Peninsula that we fondly know as Malarky’s was established in 1977 by Newport restaurateur Bill Hamilton Sr. Hamilton, who also founded the iconic Cannery Restaurant on the waterfront, opened Malarky’s Irish Pub in one of the original early 20th century structures on Newport Boulevard near City Hall. 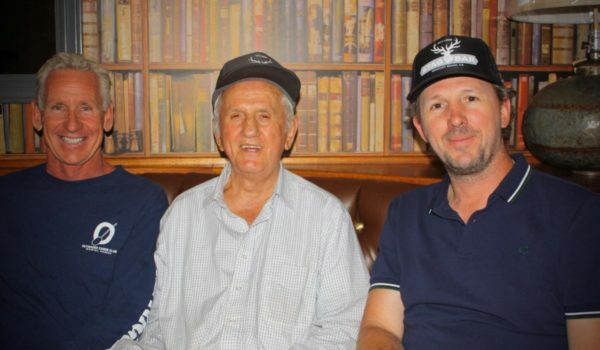 After 33 years in business, Hamilton retired and sold Malarky’s to Newport Beach resident and youthful restaurateur Mario Marovic, the entrepreneur behind Corona del Mar’s successful Landmark Steakhouse on East Coast Highway and other restaurant/pubs in Orange County. As both a resident and businessman in the community, Marovic’s goal is to be a steward of good citizenship, fostering and promoting the relationship between business and community. He is working with Newport Beach officials on a redevelopment and expansion plan of the old Malarky’s to include a new restaurant with the pub. The City Council recently granted conditional approval for the expansion with negotiation of details ongoing. You can always count on a merry party atmosphere at this Irish beach bar, even when it’s not St. Patrick’s Day. Open from 10-2 a.m. serving Newcastle beer-battered fish and chips, corned beef sandwiches and Irish stew, and pouring Coors Light, Newcastle, Bass, and Blue Moon.